I’m often proud of others that I see reaching and striving in media to improve upon the content that we have available to us. Then there are times when I have to ask myself “Where do they do that at?” Being an entrepreneur is hard work. It’s often challenging and the rewards don’t come as fast as you might like, and they are definitely not the rewards you may set out to achieve. Being a media entrepreneur is even more difficult. You have greater challenges because media is already heavily controlled by major networks and radio giants that have been around for years. ◊ This media thing is not a game. Print media is a strange animal in its own separate environment. With so many magazines being born and dying regularly due to poor business decisions, it’s very important that you have more than a pretty magazine cover. You must also have relevant, substantive, well written content in a magazine. This is primarily important if you want to appeal to people who actually know how to read. Unless of course, your magazine publication is only a pictorial, pretty pictures might be enough for your audience. As I look around at some of the ventures being put out, I notice that a lot of them don’t understand how to properly do business. Some editors are so quick to get something out there that they fail to do their due diligence with securing their content. They have pretty websites with blank pages, misspelled words, broken or unresponsive links and poor grammar throughout the site. They are trying to establish followers using social networking without a product actually being made available that people can put their hands on. You can’t even Google their publication by name. Some of them have literally relaunched the same magazine multiple times within less than three years because they just don’t seem to get it. They also don’t know how to tackle the challenges associated with the digital era where people can download and read publications on laptops, tablets and smartphones. I solemnly swear that one day people will learn how to use technology for more than just updating their Facebook status. We have to do better when it comes to the products and services that we provide in media, particularly within our own community. We also have to be more savvy in our business dealings. You don’t have to charge an arm and a leg for your product because you want to have special paper from China. You can put out a quality media product by using local resources available to you for a fraction of the cost and not have to worry about your product being delayed by customs. 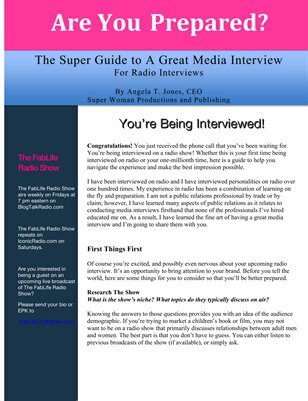 A few of the keys to doing well in the media business include having a basic understanding of business, having knowledge of your core demographic and how to reach them, knowing your strengths and weaknesses, and building a talented team of people who aren’t your relatives. Most importantly – be different from what everyone else is. If you appear to just be a recycled version of your former publication or someone else’s, without bringing something new into the equation, people will lose interest quickly…as in overnight. This media thing is only for strong, decisive people who know how to compensate for anything they lack by having other talented and knowledgeable people connected to them. It’s not about being a dictator and having everyone report back to you so that you can micromanage every facet; particularly when you have no idea of what you’re doing. It’s not about doing the same thing over and over, the same way and expecting different results [that is the definition of insanity]. This media thing is about dispersing information in a way that educates and entertains people intelligently so that you appeal to a wider demographic ~ i.e. the people who make money and make decisions. This media thing is about providing quality content that does more than create divisiveness and drama among individuals. This media thing is more than scripted reality television shows and poorly written material thrown out with the hopes that one percent of the population will like it. This media thing isn’t just about making money, putting your name on a masthead or cutting down trees for the purpose of nothing. Personally, I’m looking forward to hiring other talented people to work for The Brand so that one day I can take a real vacation. I’m aware that without hiring others, I won’t experience the true growth and success that I’m striving for. I’m thankful for the opportunity to network with like-minded individuals that have worthwhile projects that I can collaborate with them on; both today and in the near future. Growth isn’t singular when you’re a media entrepreneur. Your growth, or lack thereof, impacts others, even when you don’t see it. An idea is only as good as the work you put behind it. If you’re into this media thing as a hobby, that is your choice. But if you are in this media thing purpose driven, make it worth the time, energy and money for yourself and for consumers. This playground is big enough for many of us to be successful, but this media thing is not a game. If you’re not ready, I suggest that you do your due diligence, research and observe others who are successful and do well in media before throwing yourself in the ring.